Argos Bleak is a control voltage processor and oscillator driver with two inputs and four (count 'em, four) outputs. Its per-channel octave, detune, vibrato, and slew controls facilitate full performance control of four oscillators at once, with minimum patch cords required. It excels at bringing multiple oscillators from different manufacturers into full cooperation, with the flexibility to quickly switch between multiple performance setups. Processed control voltages are quantized to the scale of your choice, with the slew limiting able to be routed pre- or post-quantizer. A common vibrato control distributes the internal modulation signal to any of the outputs. 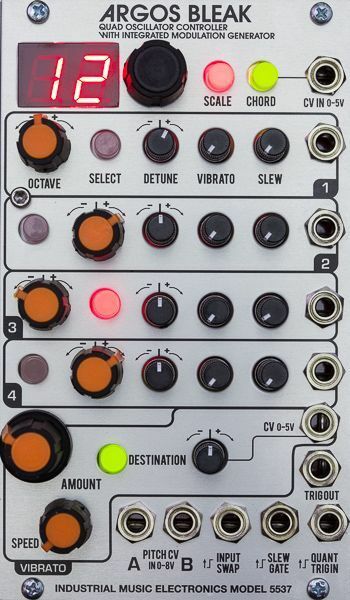 A set of performance gate inputs allow instant modification of the fundamental channel settings (input selection/mixing, slew enable, quantizer track-and-hold), and a quantizer trigger output automatically fires when channel 1 quantizes a new note. Each channel may receive its data from either (or a sum or difference) of the CV inputs, so you may run two completely independent CV processing streams, or combine the input data and switch it around using the external gate input. Each output may be offset (positive or negative) by up to 12 semitones. These semitone shifts occur pre-quantizer, effectively enabling chord construction from a single monophonic CV input. 2 banks of 16 chord presets may be stored, and instantly switched or sequenced by an external cv signal. A bonus CV mode rotates the output semitone shift data among all 4 outputs. Argos Bleak satisfies many common performance situations that require a series of oscillators to respond to tuned control voltages. CV sequences are easily and precisely transposed. FM carrier/modulator ratios are quickly and effortlessly defined, and changed with the dedicated octave knobs and chord selection.. Dedicate an output to managing oscillator sync frequency, apply vibrato, and your modular system is suddenly playing pinch harmonics. The calibration routine is simple, and your attached oscillators can be easily calibrated to each other by ear using the channel controls. • Diatonic scale quantizer from Stillson Hammer mkII. All scale modes and some smaller chords are available, as well as 12-tone and unquantized options. • 2 banks of 16 chord presets each. Chords may be manually changed or switched by CV input (0-5V). • 3 performance gate inputs for remotely toggling input selection, slew, and quantizer units.